Turkey plans to build a canal connecting the Black and Marmara seas as an alternative to the congested Bosphorus Strait, Prime Minister Recep Tayyip Erdogan said on Wednesday. "We are rolling up our sleeves for Canal Istanbul, one of the greatest projects of the century that will outshine the Panama and Suez canals," Erdogan told a party gathering. 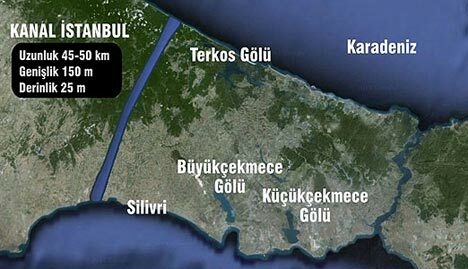 The waterway, to cut through Istanbul's European side, would be 40-50 kilometres (25-30 miles) long, with a width of about 150 metres (164 yards) and depth of 25 metres, he said. The announcement of the plan - long kept secret as Erdogan's "crazy project" - came as part of the prime minister's pledges ahead of parliamentary elections on June 12, in which his Islamist-rooted party would seek a third straight term in power. Preliminary studies and the drawing up of the project, expected to take two years, will start after the elections, Erdogan said.